Gasoline vs Electric: 2017 Nissan GT-R vs Tesla Model S! - Muscle Cars Zone! This is by no means an ordinary acceleration challenge. There are many Model S vs supercars drag races done by various gearheads around the world. 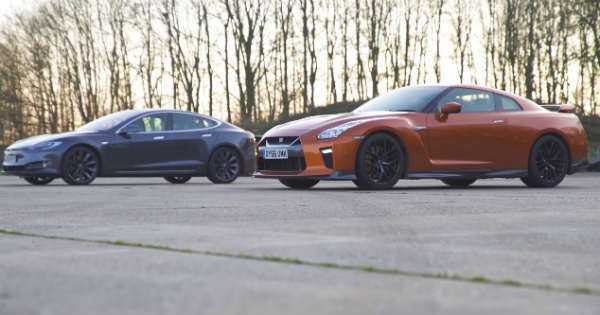 However, just when we presumed we had seen them all, we stumbled upon a sprinting drag race pitting the newest iteration of the GT-R against the electric superstar – the Tesla Model S. Just like in every Carwow video, this one packs all the wonderful ingredients as well. However, this is not the P100D because that model is not available in the United Kingdom. Having said this, the Tesla competing in this video goes by the P90D badge. As the Godzilla is concerned, the latest GT-R is more than hungry to devour some green energy machines. This supercar has already spanked the latest Acura NSX on several occasions, from track battles to drag races. This four-stunt adventure you can see in the video below involves a pretty realistic acceleration challenge that can happen in real life as well. However, there is a few things that are a bit unlikely to occur outside the gearhead journalism realm. Let`s return to why is the Godzilla not racing the P100D which is Tesla`s current range-topper? Well, even if it is involved and loses, it will still require a rematch because Elon Musk stated that the acceleration-boosting software for the P100D should be released somewhere at the end of 2017. This is a very great comparison video between gasoline and electric because both of the cars involved in this challenge cost the same money. Finally, if you want to read an in-depth comparison of gasoline and electric vehicles, do so here!